The oldest, the Cambrian, was named from Cambria, the Latinised form of Cymry (Wales); why? I hear you ask….because the Victorian geologists who mapped and named these rocks and who first realised that almost all of the rocks in North Wales were of a similar age, all studied Latin and Greek before they took to geology. They also realised that these rocks became progressively younger as they moved southwards and coined the names Ordovician and Silurian from the Roman names for the Welsh tribes that the legions had to overcome in the different parts of Wales. And just as the legions have disappeared, so all of the fossils of marine creatures preserved in these Welsh rocks such as trilobites and graptolites, are now extinct. And as we proceed up the Stratigraphic Column, it will become apparent that one of the most characteristic facts about the record of living creatures that it records is the almost all are extinct. Each Period is further subdivided into Stages, also named after a particular location and it is these stages and their fascinating names, that we shall spend most time exploring. None of these stages lasted the same length of time – this irregularity is one of the keys to the weirdness and un-predictability of geological time, and is the hallmark of the Stratigraphic Column – and of the future. Every name in this story of time has its own history, but even though the Stratigraphic Column looks neat and tidy but crowded, it came into being in an almost random fashion. The naming began during the Industrial Revolution, when people began to look with new eyes at the earth on which they built their cities, roads and canals. Its early growth was not logical or progressive, and it just tumbled into place; but as it grew, it developed an internal logic that we can now explore, as we would the floors and rooms of a castle. So, I want you to imagine climbing all of the steps that lead to the top of this outrageously fairy-tale castle, built by King Ludwig of Bavaria, not Walt Disney. We will enter via the drawbridge and, while we might look down at the dungeons, our main interest will be what happens in the rooms and corridors from the ground floor up. This castle is one of the more eccentric ever built, as was the Stratigraphic, or ‘Strat’ Column that geologists have constructed, where each level is defined by a new beginning. As in our castle, it comprises three main flights of stairs, each separated by a landing where astonishing things happened, where whole species have vanished and new ones have appear and the different segments of the earth’s crust on which we live have collided and separated. The ground floor marks the beginning of what is called the Palaeozoic or Ancient Life Era which began 542 mya, also known as the Cambrian Explosion, so sudden and unexpected are the fossilised life forms they contain. There are two subdivisions to the Palaeozoic – an early ‘Welsh’ period, or age of trilobites and graptolites and simple reefs, and the later ages of fish, amphibians and forests, early mammals and reptiles, and new more complex reefs. Each step occupies a different length of geological time, each with its own unique assemblages of fossils, and history of extinctions and radiations, and off each step there are passages….. The two main landings mark short periods of immense turmoil and extinction, old fossils disappear, mostly for ever, a few survive, but it is new ones that proliferate. The first landing signals the ‘Great Dying, the end Permian mass extinction 251 mya, when most Palaeozoic or ‘Ancient Life’ fossils vanish, to be replaced by new types which define the Mesozoic or Middle Life Era – the age of dinosaurs and ammonites. The second landing dated at 65 mya defines what is known as the K/T extinction which saw off the dinosaurs, helped perhaps by a massive meteor strike; it is followed by the Tertiary/Cenozoic or – New Life Era, the age of mammals and life forms that become increasingly like the living creatures that we see around us today. There is even the suggestion, at the very top of our stairway, of a new landing, above which might be a whole new Period – the Anthropocene defined by human activity. 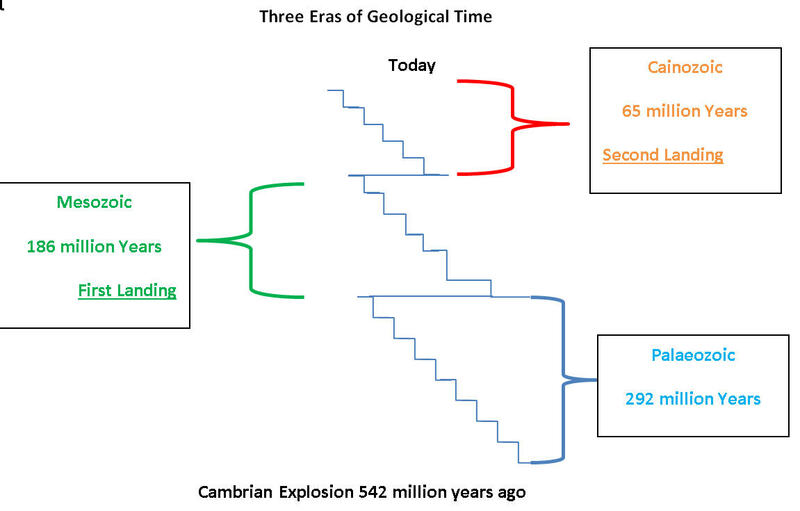 There have been five or perhaps six major extinctions when up to 90% of species disappeared from the fossil record but these numbers represent only 5% of all of the species that have become extinct since the Cambrian. So pervasive is extinction in the stratigraphic record that a definition of almost any form of fossilisable life should perhaps include the fact that it will become extinct. As in human history certain events are more significant than others; the Battle of Hastings in 1066 is but one example, important to the history of the British Isles perhaps but not as significant as the meteorite impact that seems to have shuffled the last of the dinosaurs – except for the birds, off into extinction. Again, as with human history, geological events are rarely synchronous but in human terms, they appear so, because much of geological time can only be measured in increments of 100,000 years, whereas all of human history since the invention of farming, fills up only 10,000 years. The closer we come to the present day the shorter the time intervals become, till we stumble into the realms of archaeology and eventually, precisely timed records of the extinction of empires, cultures and animals. Without the Stratigraphic Column, we would not know which way was up, nor would we be able to appreciate that the present day world is just a whistle stop on a voyage that will carry us forward into the future. Question it we can, challenge we can not. How long has this being going on? Archbishop Usher, Bishop of Armagh in Ireland in 1650 AD, famously calculated the age of the earth by counting the number of generations, or ‘begats,’ listed in the Old Testament since Adam was a boy. His conclusion, that the world began on Sunday, 23 October 4004 BC, was equally famously incorrect, but his methodology was sound. You might look like your father or mother, but you are not them, they were born into a different world and were on average shorter than your generation – and there were no I-phones or laptops. Skeletons of early Europeans are shorter still, and there were no mod cons of any sort, and if you look carefully at this type of evidence you can eventually deduce how long ago it was that your first ancestors appeared and build a human Stratigraphic Column, with several extinctions such as Neanderthal man. As with kings, the sudden disappearance of a particular zone fossil identifies the turn-overs in history, such as the BC-AD divide. All of the English kings and queens since William the Conqueror (1066 and all that) have left coins with their image – and while written paper records are vital for detail, the coins are more robust and remain, while much of the paper has rotted away. So we are able to divide English history into different periods on the basis of a succession of mainly kings and queens. The old “One Pound One Shilling” or Guinea, first minted by Charles II in 1663 as a pound coin, was increased in value to twenty one shillings from 1717 until its last minting in 1814. Similar histories attach to all the coins of the realm, most of which are now extinct. Sovereigns, first issued by Henry VII, are still minted, but not for general circulation; others that vanished over time were crowns, groats, florins and farthings, then half crowns, shillings, three-penny bits, pennies, half-pennies. Until finally, all go extinct at the great decimalisation extinction crisis of 1971, leaving only pounds and new-pence; but there were stragglers – such was the status of the guinea that its ghost remains in circulation – as the nominated value of a prize for horse racing. Like fossils, there are also regional variants or species, the Scottish shilling having different obverse marking, as did sterling coins in Australia, New Zealand, India, Canada and many other colonial regions. And of course, the further back we go in time, the less well preserved coins are; but, when not melted down, they maintain their appearance better than paper or stamps. 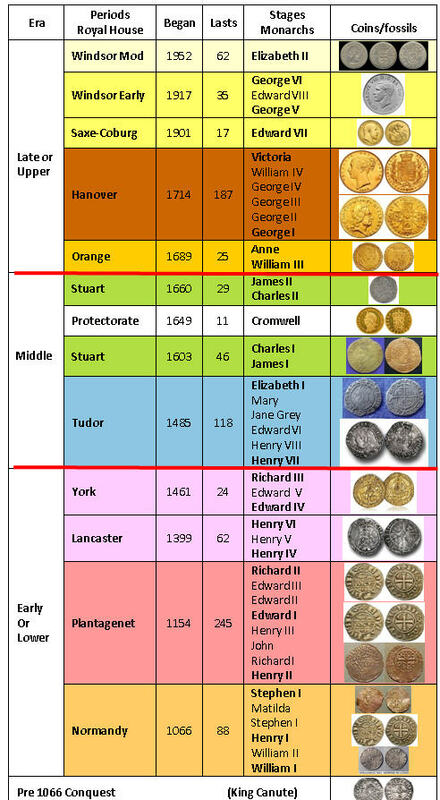 Looking at this table of English Royalty, there are three Eras: Early, Middle and Late, over a dozen Periods depending on how you arrange them and forty one Stages or reigns, some lasting longer, and some more significant to the life of their times than others. I have taken a few liberties that historians might object to, such as putting the boundary between my Middle and Late Eras at the death of James II, and not after the death of the last Stuart, Queen Anne; others might put the boundary at the Elizabeth I extinction – So it is in geology. Naming things is an essential step in being able to think about their significance and is the reason why the Inuit language has far more words for snow than does Arabic, and why there are so many names in the Stratigraphic Column. However not everyone is happy, and Wordsworth was one of those with little time for geological name giving, dismissing geologists (prior to becoming friendly with Adam Sedgwick) thus:What makes the choices difficult is that, no matter where the boundaries are placed, some of the life that existed during a particular reign may have existed before, or ended after the royal extinction, Shakespeare for instance was writing during the reign of Queen Elizabeth I, but did not finish until well into the reign of James I, to which period or stage does he belong? So it is in geology. Naming however is an essential part of human culture and so it is no surprise that the different forms of life preserved as fossils have names which are an essential part of the Stratigraphic Column. The blog will not pretend to be academically sound as it is aimed at stimulating an interest in the Stratigraphic Column and in its history, not in proving anything new, revolutionary or old; nor will it always be ‘correct’ in its use of geo-poetry or jargon. It will be added to and amended as new data becomes available, and as there are over 100 stages and many permissions need to be obtained for the copious illustrations of the existing text, it may not be completed for some time.